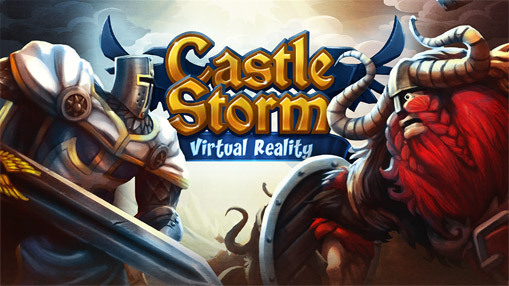 One of the new releases for the Samsung Gear VR (reviewed here) is the VR version of the popular action strategy game, CastleStorm. It’s available both for the Samsung Gear VR and the Oculus Rift. I tried the version for the Gear VR. CastleStorm is a realtime strategy game with action elements. Your objective is to destroy the opponent’s castle using your weapons, your army, and even your magic. At the same time, you’re doing your best to survive the opponent’s onslaught as well. It is somewhat like a mix of Angry Birds with realtime strategy elements. As you increase levels, you add different weapons, troops and magical abilities, powering them up using the gold that you win from battles. Some have criticized this as a “lazy” implementation of VR, but for me it works. I find it much more enjoyable than the non-VR version. Here’s an experiment: you can download Herobound: First Adventure, an action adventure game that shows a similar point of view. If you enjoy Herobound much more than a similar non-VR game, then there’s a good chance you’ll prefer CastleStorm VR over the non-VR version. One criticism I have is that when aiming your weapons with the ballista, the controls are ridiculously sensitive. A 1mm movement might correspond to 1/8th of the battlefield. It’s almost requires the precision of a brain surgeon. Otherwise, the game is fun and is one of my current favorites for the Samsung Gear VR. CastleStorm VR requires a Bluetooth controller to play.